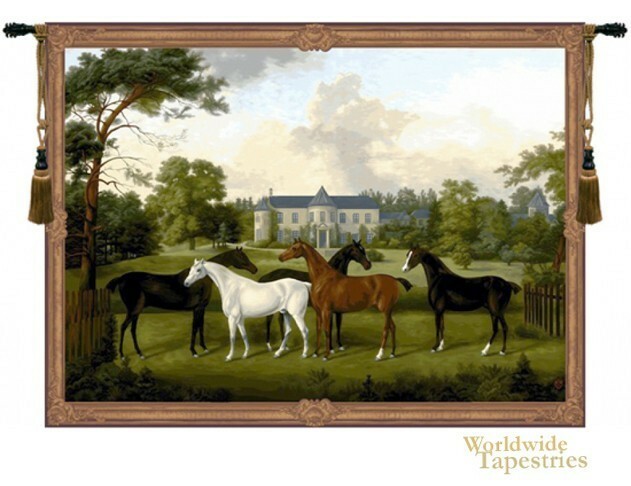 In this tapestry scene, we see a parade of horses in a variety of colors in front of a country estate. The coat colors are white, chestnut and three with mahogany in formation about to enjoy the day on the spacious grounds of this French country home. The entire scene is an idyllic rendition of country life with gorgeous horses on the estate. This horse themed tapestry is backed with a lining and has a tunnel for easy hanging. Note: tapestry rod and tassels, where pictured, are purchased separately.